When a snowmobile manufacturer produces a new sled they usually carburet the engine on the conservative side. This means they could run a slightly larger carburetor and make a little more power. The reason they usually opt for the smaller carburetor is overall performance and fuel economy. A smaller carb will flow through the entire rpm range at a higher air velocity (speed). At any given rpm, higher air velocities improve both throttle response and fuel atomization. Then why would a snowmobiler want to bore a carb? When you bore a carb, you will usually get a little more horsepower on the top end (peak horsepower). The trade-off will be the loss of some low end to midrange power as well as throttle response. The reason for this is simple; the boring made the carb larger. This decreases the air velocity. Let’s explain it another way. Place some small pieces of paper in front of yourself on the table. Fill your lungs with air, pucker up and blow the paper scraps off the table. Next take those same scraps of paper and try to blow them off the table with your mouth wide open. There will be a noticeable difference in the paper’s movement even though you used the same amount of air in both cases. This is a good illustration of air volume versus air velocity. Fuel is a liquid that is drawn into the carburetor’s air stream. The higher the air velocity, the better the fuel will atomize. We need air speed as well as air volume to atomize fuel. The larger the carb on any given engine, the slower the air speed at any particular rpm. The problem boils down to this: When you bore a carb in a conventional fashion (straight through the carburetor), the bore becomes larger very rapidly at lower throttle settings. This slows air velocity and kills performance until the engine has time to catch up and produce a higher air velocity and uses the extra air volume on top end. Now everything is fine until you have to start this process over again. How about a way to keep your bottom end and lower midrange while increasing upper midrange to top end? There is a way – oval boring. Here is how it works. The carb is bored in an oval shape, keeping the bottom half of the carb near stock proportions (smaller) while gaining a significant flow increase on top end with a larger bore. The oval bore is a better shape for a carburetor than any other. Take a look at the shape of a 40mm carb bored to 44mm in the accompanying illustration. The actual area bored is a modified crescent shape. Notice how the bore becomes larger gradually as the carb slide is raised. As the engine rpm pick up so does the engine’s ability to handle the increased air fuel mixture. 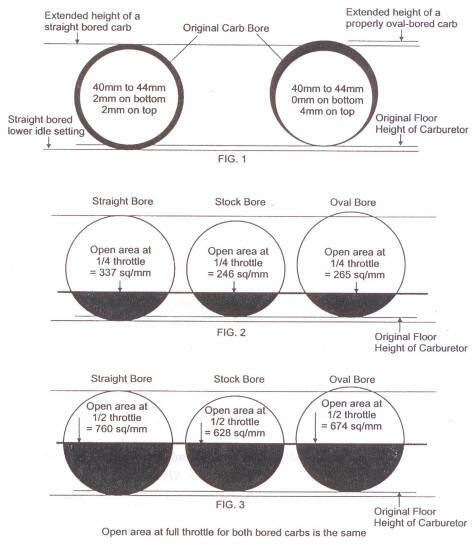 Compare this to the straight bore carb that increases the bore diameter very quickly. The picture comparing the 44mm round bore carb to the 40/44 oval bore carb will help you understand how the carbs will react very differently as the throttle is opened. The size of your carburetor slide determines how far your carb can be bored. Here is a general guideline for oval boring dimensions for Mikuni round slide carburetors. What size carb should you use? When selecting the proper size carburetor use the smallest carb that does not restrict peak horsepower. Let’s say your engine makes 150 hp with either a set of 44mm carbs or 40mm carbs. Use the 40mm; they will give you a higher air velocity through the power band. This means better efficiency in terms of throttle response, fuel atomization and economy. Horsepower is measured and determined by air flow so take all you can get as long as you get good flow and velocity all the way through the rpm band and your engine is equipped to handle it. A set of UFOs (Ultimate Flow Optimizers) will increase airflow and velocity by 10 to 15 percent and greatly improve fuel atomization and performance. You can expect to gain approximately one hp per 100cc of engine size with UFOs. Dial-A-Jets can be installed on the same carb eliminating the need to ever change main jets again. Dial-A-Jets offer a number of other advantages such as more horsepower, quicker throttle response, and improved fuel economy. When you oval bore your carburetors, make sure you are dealing with a qualified machinist who also knows how to bore and tune your carbs as they relate to your machine. It can be a little tricky if you are not dealing with an experienced tuner. This is not the time to deal with an amateur. Beware, there are some methods of carb boring that promise to make your sled run like a bullet but do little if anything in reality. Any method of carb boring that works should require some rejetting and clutching or they simply are not making additional power. Be sure to ask how the increased power relates to clutching. Remember, once the engine makes more power, the clutch must be recalculated to get the power to the ground.